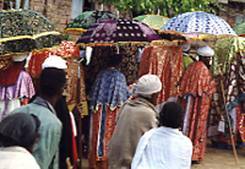 The North is certainly the most visited area in Ethiopia. Three routes are especially interesting. A sacred town for the Christian population, listed Humanity World Heritage by UNESCO, with its eleven churches carved out of the rock. On the road to Lalibela, you can visit the Blue Nile Falls, Lake Tana and its islets where residents live peacefully, cultivating and fishing, sheltered by centuries-old churches that contain barely protected treasures. 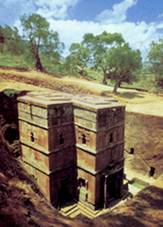 Little detour and you can see Gondar with its palaces and a very beautiful church, Debré Birham. 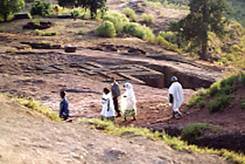 - The ancient city of Axoum and the Simien mountains. Hiking or mule trekking, the area allows you to discover exceptional landscapes: sinkholes, faults, gorges, forest of volcanic peaks and needles. - The Tigrean massifs with their rupestrian churches (more than a hundred have been counted). Perched on top of the mountains, the churches are not usually easy to reach, but the surrounding scenery is of exceptional beauty. If you can spend 8 to10 days, you will be able to choose one of those routes. But, if you can devote three weeks to your trip, you will be able to take in a complete tour of the North, along the "historical" road.